Here are some shots from the Roland Mouret RTW show A/W 2014/15. Both of these fabrics were available at Simply Fabrics in Brixton at different times. I bought the pink one, which I think is gorgeous. I just love the deconstructed dog-tooth check – it’s so bold and different. So, as a centrepiece for my SWAP, and in fact the unifying factor – featuring bold magenta and grey – I bought a couple of metres. I was thinking of a reversible coat or other item when I saw this fabric and was originally attracted to it as it is great on both sides, as you can see on the second skirt. The grey side is smooth, the pink side has a nap. While I had preferred the grey side, Neucarole suggested that the pink was the right side. Turns out she was correct. Also, when I was thinking of using this fabric for a suit she warned me about pattern matching. And turns out she was right about that too. With the items above the pattern is matched horizontally but the draping and cut prevent it more generally. I think the left hand suit is a bit messy in the waist line area. So thank you Carole, a coat it is, and while we have confirmed that pink is the right side I still prefer the grey, but I will endeavour to get the pink on show, somehow. Now I have a decision to make. It is not urgent as I have other work to get on with. But if I make a coat I need to choose the right pattern for it. My first thought was a Burda pattern I have made before. The great advantage here is that the style is simple and will involve minimal matching. I could do the collar and lapels in the reverse fabric. Or perhaps the sleeves. But then the RM photograph perhaps suggests a sleeveless coat? My second idea is to make a coat pattern based on one of my own designs. 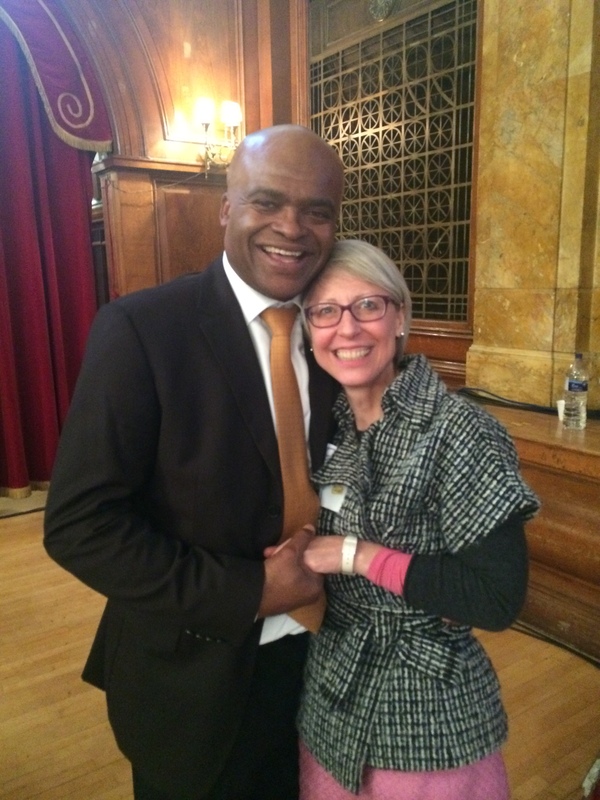 Here I am with Kriss Akabussi at a Notting Hill Housing event last month (we look after his brother). I had in mind taking this kimono sleeve jacket and lengthening both the sleeves and the hem. It has a nice military collar, a wrap front, no buttons and is tied with a wide belt. The third idea is to make up the coat that comes with the Nina Ricci suit that I am currently making. I am on a roll here, and tempted to just get on with it. However, while I like the style of this coat very much I think it would probably be better in a plain cloth. I do have other coat patterns. I could buy a new one. Or I could use this fabric for something else entirely. 100% of my vote is for the Kimono coat…..a drape to give life to the pattern (the ‘right’ side IS a revelation……..) good luck! Loved that kimono when you first made it and I still love it. I wouldn’t go for the last pattern that you show…..as the pockets would get lost in the pattern. That last coat would be best in a solid colour so that the pocket detail is visible. – The only issue with the first coat is the open front….I have had a coat like that in the past, and it wasn’t the best for keeping me warm…as it gaped open…..definitely needed a scarf. But I am from Canada where it’s very cold in the winter! I agree with all the above comments. The Nina Ricci is lovely but you would lose all that detailing with the patterned fabric. I like the boyfriend coat, but can see that it might not be cosy. The kimono coat is just fab on you and you can already see that a geometric pattern works with this style. And the belt could be the point where you get the ‘reverse’ side of the fabric on show. I think long sleeves would be nice though. Just have to add that I am continually amazed at how much you get done!! A coat like that would take me about three weeks. and I certainly wouldn’t have time to work and write a blog and go to art classes and catch up on other people’s blogs and look after family and have a social life. I’m so impressed. I think the kimono coat is the way to go too, and I totally agree with Caroline’s comment. Keep em coming. I do love the kimono jacket, which really suits you. The coat you made for Esme is also lovely. All that said, I am realizing myself that I get bored easily with making the same thing a second or a third time (silly, I know!). Something I really like about the Roland Mouret designs is that they seem to flow and there is some modern asymmetry to them, while they maintain simple lines, e.g. cross over front, slim shape. The contrast collar offers a nice effect, too. I wonder if you could pick up some aspects of coat two (which has the asymmetry) but in a more fitted silhouette. I especially love the opening in the skirt on the left. Just musing! I’m sure you’ll come up with something chic! I love the collar on the kimono, it’s softly flattering and will suit you in the pink and grey. Unlike, Stephanie, I do like repeating patterns, I think I learn processes better that way and they’re more likely to stick. You’ve had time to evaluate what you’d like to change this time too and those should be relatively straightforward. Buttonholes in boucle can be tricky, you can neatly sidestep those too. I think I agree with you Symondezyn – I really want the Nina Ricci coat but this isn’t the fabric for it. At the moment I am not sure I am doing the coat for SWAP – this fabric works brilliantly but I am not quite done with the separates – maybe I will force the fabric into a Kimono jacket and skirt. Too many options. I agree the v1650 is a great look for you, and from a bold coloured fabric. I feel that a Kimono jacket with large rectangular sleeves? if oversized, my swamp you. Anyway, don’t make a decision until it feels perfect and you can ‘see’ it.